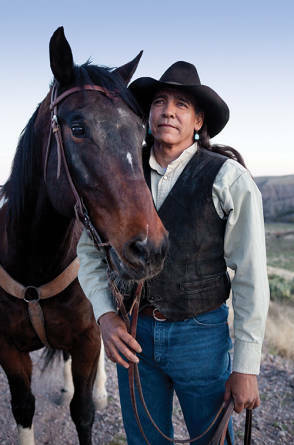 Joe Saenz, the top guide in Southern New Mexico, holds a loose rein on one of the horses he raised from a colt. In the middle of a piñon pine cluster in the southwest New Mexico high country, Apache wilderness guide Joe Saenz was explaining traditional sources of Vitamin C in a voice so soft that I, a relatively novice horseman, had to lean dangerously sideways to hear him. “Pine needles when necessary, but what my people traditionally really liked were these sumac berries,” he explained. The nutritional demo was Saenz in a nutshell, because it covered two subjects he focuses on every trip: natural and cultural history. For Saenz, they are intertwined. This is due, no doubt, to his being a guide in his ancestral home. He’d told me before our trip began that his family was not among those Warm Springs Apache people forced into exile in Florida and Oklahoma in the 1870s and 1880s. “They fled into Mexico a generation earlier, surviving the best they could, and made their living through livestock and saddle making.” For a while, they were refugees few knew about. “It was considered too dangerous to enter back into the United States,” he said of their decision to remain in Mexico. Despite the family’s decision to live incognito for two generations, Saenz, who was raised nearby in West Texas, believes he never lost connection to the Warm Springs Apache homeland (now the Gila National Forest) because, whether he was ranching in Texas or guiding across the Southwest, he was never far away. Fifteen years ago, he repatriated himself to his ancestral home for good. “I finally realized that the time had come; I was ready to educate people about Apache culture. So I came home. Immediately, it felt like the most natural occurrence. Hugging the east slope of the Continental Divide outside Saenz’s Arenas Valley home 10 miles from Silver City, we rode past budding cholla, blooming purple milk thistle, and copious clouds of butterflies. My horse dipped her head for a drink in one of the high-desert creeks, and I was just beginning to think I could hear individual wing flutters, when a family of javelina, the small Southwest boar, startled us by darting through a thin thicket of cottonwood and juniper trees. Dancer, my dark brown mare, didn’t flinch. This wasn’t luck. Saenz has raised all his horses from colts. Perhaps because of this, Dancer has the most spirit and best habits of any horse I’ve ever ridden. Saenz’s Wolfhorse Outfitters never takes a group larger than four, in order to ensure an intense, intimate education that’s both cultural and natural. But what Saenz really provides, by guiding a different route every time through the millions of acres of the Bootheel’s Gila National Forest, is access to quiet in a noisy world. Though he welcomes all skill levels and is himself as comfortable on a horse as a day trader is at a keyboard, Saenz doesn’t baby you on the trail. In fact, he somewhat objects to the idea of trails, and teaches his clients to ride alongside him in the backcountry according to what he calls Indian Style. Though he encourages riders to fan out and choose their own way through the tight willow thickets and wide meadows of America’s first federally protected wilderness, if Saenz feels that Point B is better for the overall immediate ecosystem than your Point A trajectory, he’ll let you know, even if it’s in that quiet, measured voice. It’s all in the name of showing that proper backcountry etiquette is not just the way to have the lowest impact on his ancestral back yard, it’s the way to have the most sublime ride. Our goal this day is to visit one of the biggest known junipers in New Mexico, a 600-year-old living megalith that had the added advantage of providing a shady, streamside resting place exactly halfway into our ride. We weren’t riding an hour before I saw that if silence is truly one of the most precious commodities in today’s world, you get a five-star trip when you hop of one of Saenz’s horses. Lack of synthetic noise is a prime feature of the Land of Enchantment wilderness. Then, toward the end of the 19th century, the Warm Springs Apache, after decades of guerilla warfare against the United States and Mexico, and failed attempts to create reservations in New Mexico, were exiled, one of the last North American native groups to surrender their land. I wondered if these century-old wrongs were being addressed in any way in 2012. “What say do Apache people have in the land’s management, for example?” I asked Saenz as he unhitched the horses for our return ride. In addition to rookie saddle soreness, I came away from a full day riding the Gila alongside Joe Saenz with practical knowledge about my southern New Mexico back yard (the streams we crossed feed the river that flows outside my own ranch, 25 miles away). I learned that yucca roots can be ground into a frothing soap, and the needle-sharp bristles, when frayed, make pliable and quite functional paintbrushes.